I recently visited the Vedanta Society of Northern California to meet Swami Prabuddhanandaji, the head of the center there. He has been ailing for some time now and I felt that I had to meet and enquire about his health. Meeting him brought back some memories of more than 20 years. I had met him for the first time in March 1991. 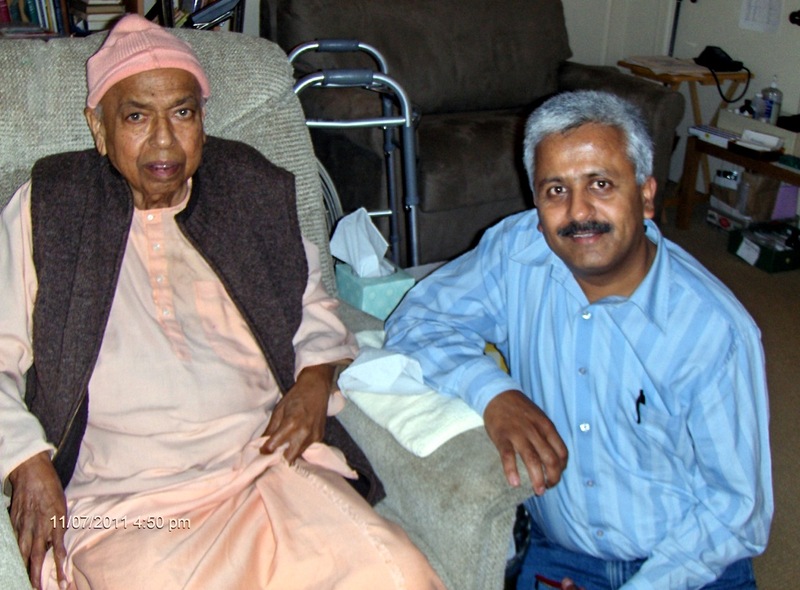 I had come to the United States for the first time and Swami Sureshanandaji had asked me to meet with him and seek his support for SVYM. Both of them were contemporaries and had joined the Ramakrishna Mission at around the same time. Swami Sureshanandaji had spoken very highly of him and I went to San Francisco and spent a wonderful week with him. Swami Prabuddhanandaji had given me precise directions on how to reach the place on Vallejo Street and I was put up in the old temple close by. I enjoyed the daily interactions with him, Swami Sahajanandaji (who has since passed away), Swami Vedanandaji and the few serious devotees who visited over the weekend. Swami Prabuddhanandaji was very impressed with how SVYM was founded and how Swami Vivekananda had inspired the work all along. He wanted to know what we were doing (not much compared to the activities today) and what our plans for the future were. I was a novice who had no idea of philanthropy management or fund-raising, and Swami Prabuddhanandaji took on the responsibility of mentoring me. He spoke to me on making presentations, preparing suitable PR material and how to build donor networks. He seemed to have an endless list of people he knew across the US and he started introducing me to them. From Ms Barbara Piner, SV Murthy and Radhakrishna in the American Service to India to Ms Raj Prabhakar in Lubbock to Narayanaswamy Gowda and Shaku Shankar and others in the Bay area – he introduced them all to me. Each one of them has visited our projects over the years and has been very instrumental in helping raise funds for us here in the United States. As I spent time talking to Swamiji who looked frail and weak, I realized the extent of support and encouragement he had been silently giving me over the years. He was the ever-curious person that I had known and wanted to be updated on all the projects that we were undertaking since his last visit to our place. He wanted to know how each person he had met was doing and I was fascinated that he remembered not only their names, but also what they did at SVYM. He was fondly recollecting the visit to the Hosahalli school and the lunch that he had with us on that day. He was very keen on knowing about GRAAM, our latest initiative and wanted to understand how public policy worked in India. His sharp mind and excellent memory reassured me that he was on his way to recovery. As always, he was the perfect host. He wanted to make sure that I was comfortable in the old temple and that adequate arrangements were made for me. I still remember how I had foolishly underestimated the microclimate phenomenon of the Bay Area and gone unprepared for the unpredictable weather. Swamiji had graciously offered me his coat in 1991 and explained to me the importance and the art of staying warm. During our conversation, the subject drifted to Swami Achalanandaji, my spiritual mentor. I was telling him how I missed him and how I did not even have a photo of him. Later that evening when I met him to bid farewell and take leave, he showed me three aging black and white photographs of Swami Achalanandaji and himself taken more than 40 years ago. He promised to have them scanned, photo-shopped and sent to me by email. I was touched when Swamiji gently thrust $500 into my hands and told me that I could put it to good use in GRAAM. It was his own way of validating the usefulness of GRAAM and what it could do in the future. I felt reassured and recharged as I embark on this next phase of my life in SVYM.